Two weeks until due date. I’m pushing my way through the small number of items that absolutely must get done before welcoming baby, and delighting in a few little Just-For-Fun-sies. 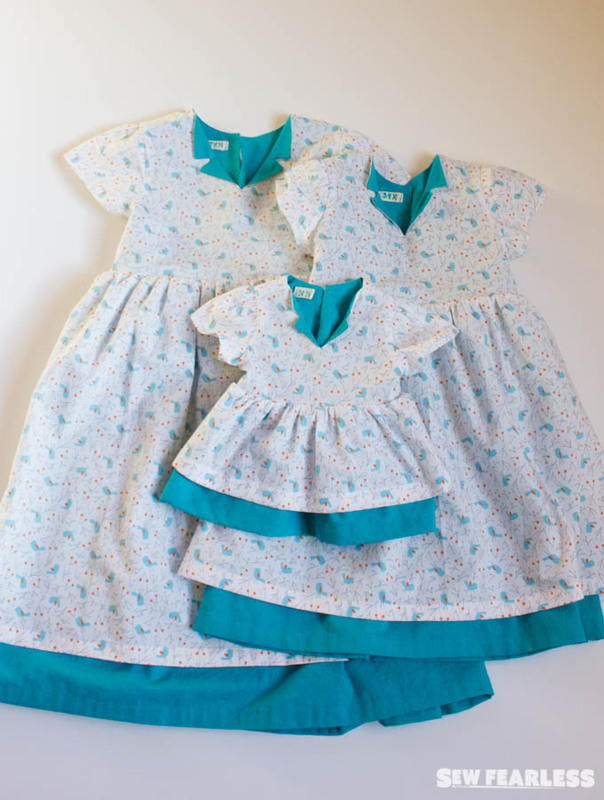 This set of three matchy Easter Dresses being the latter. Before we get any farther, here is a necessary legal disclaimer: Organic Cotton Plus provided the fabric in this post in exchange for a review. Jennuine Design gifted the pattern to me, because she is cool like that. All words and opinions in this post are mine. My girls are so thrilled when I make them matching outfits. 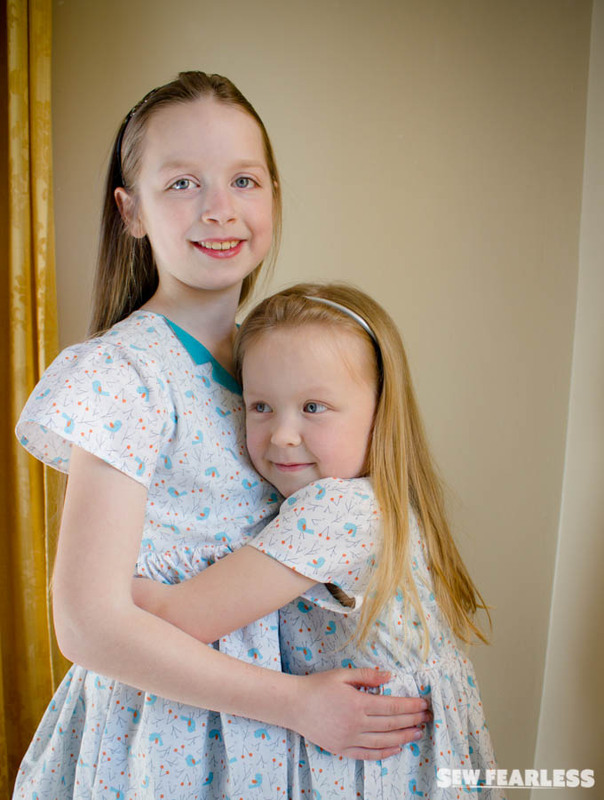 I don’t know if it is because one isn’t jealous of the other’s Mom-made outfit, or because they genuinely like dressing the same. Either way, making an outfit for “New Baby” too, just put it over the top. 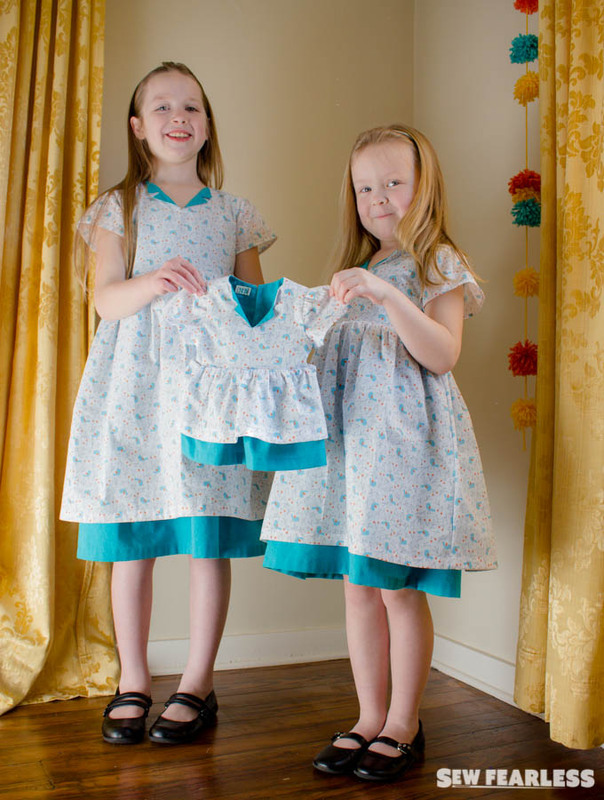 There were a lot of squeals of excitement and “oh so cute!”-ing going on between these girls and I while sewing this dresses. This is a fabric review post so let’s take a minute to talk about the fabric. 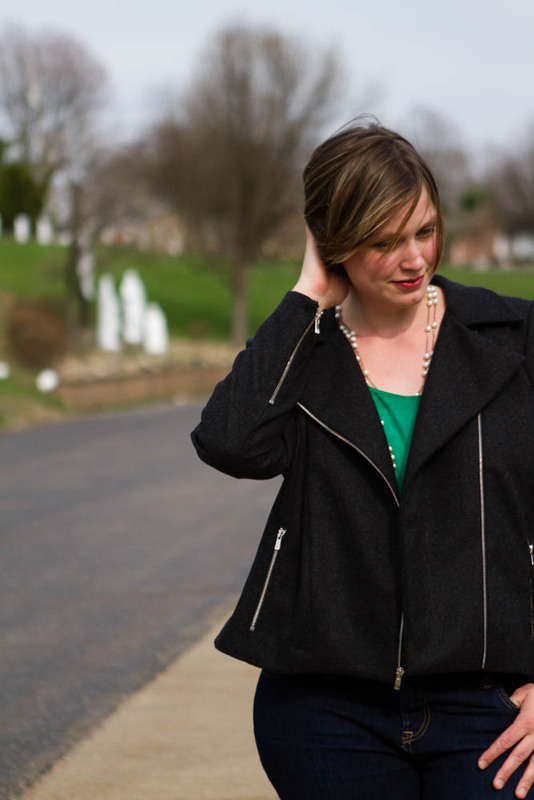 The outer dress is a lovely poplin – smooth, stable, and lightweight. It feels totally quality and I can tell it will last for a while. Even after a hot wash and dry, it didn’t pill or lose its hand. For the lining, I used a broadcloth. It arrived with a really lovely texture (it has heavier threads and a looser weave) that softened up even more beautifully after washing. I could say it almost “fluffed” up a bit. 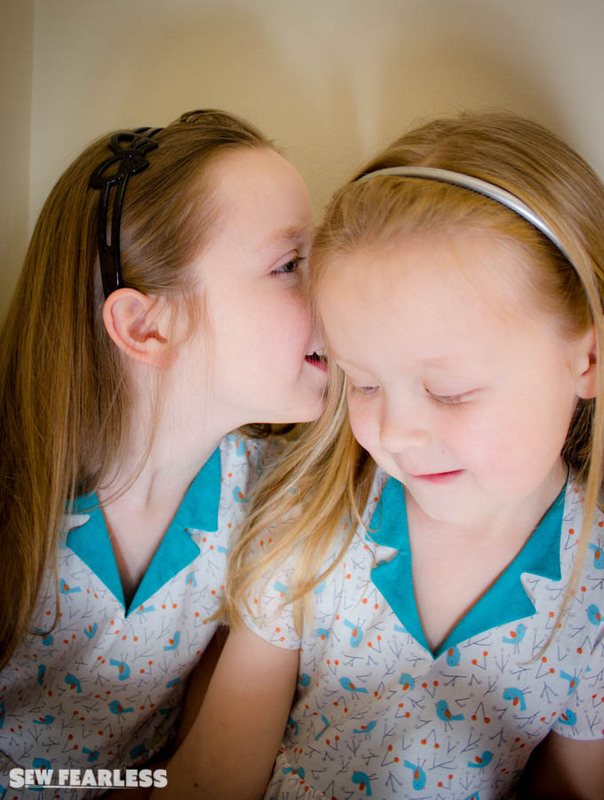 My daughters kept remarking about how soft the lining of the dresses were. I can tell they will be worn all summer. Kids love to wear clothes that feel well to wear. Organic Cotton Plus brings together eco-friendly products with an ethical and environmental conscious to unparalleled quality and design. We have an unwavering commitment to fair labor, sustainable materials, minimalist packaging, and a close eye on the carbon footprint on each product. We are proud to be certified to the Global Organic Textile Standards (GOTS). That’s a pretty worthy goal. Isn’t it? 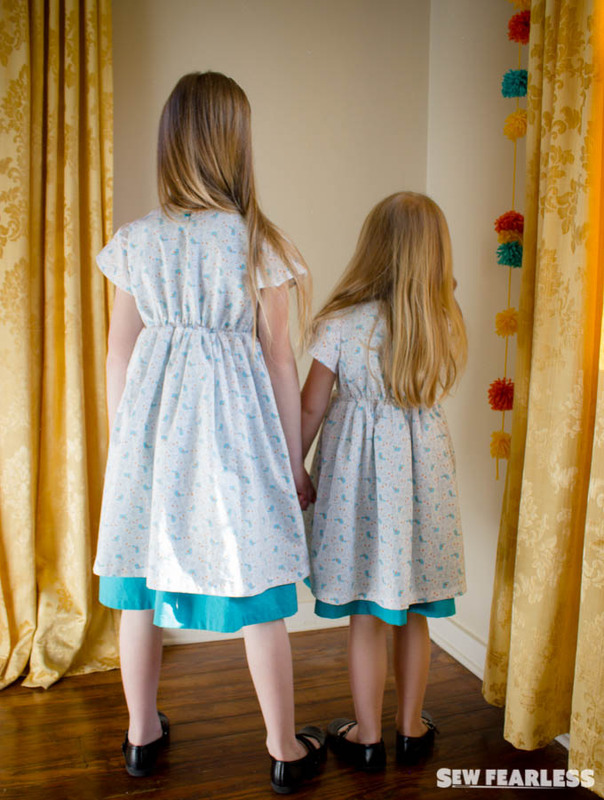 I feel in love with the “Bird Song Poplin” and needed a dress pattern that would be suitable for such a fabric. 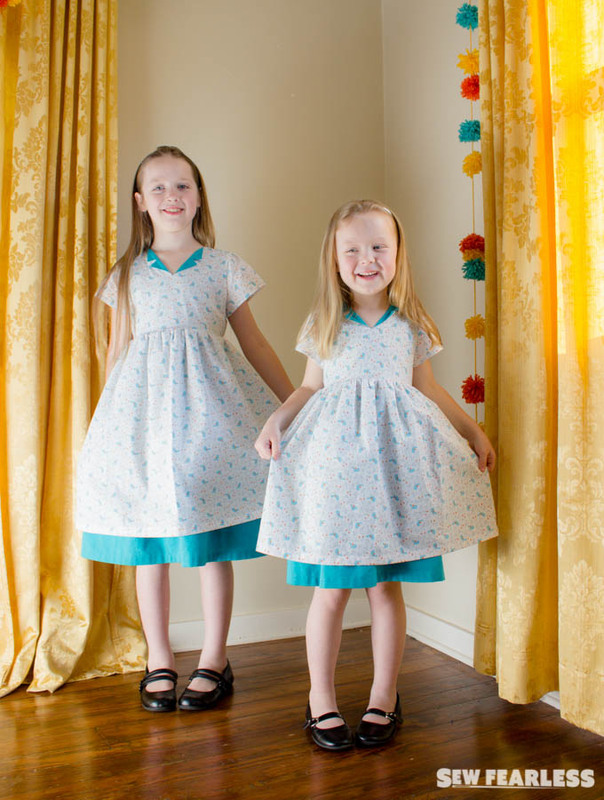 The Verona Dress by Jennuine Design fit it beautifully because it calls for a full lining which the white poplin needed, and had a number of sleeve options to choose from. I have always been pleased with Jen’s patterns. Her sizing was spot on for my girls, and she adds really nice details like the elasticized back to keep the dress laying nicely. The only thing that remains for this project to be truly complete, is for me to get a baby girl to put in that teeny dress! Come out soon, baby girl! The Bonjour ladies are ready for you! 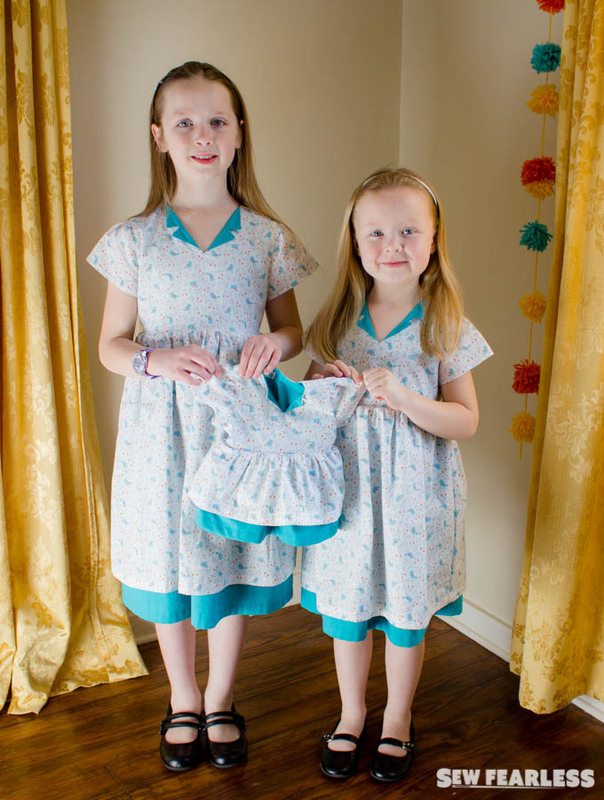 I love the collar on these dresses as well as the elastic in the back. 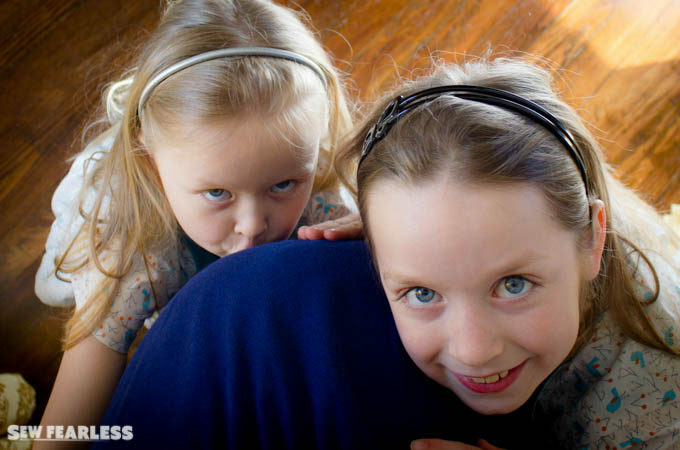 They are adorable and your girls make them more so! How did you know to purchase the turquoise over a lighter, baby blue broadcloth? I fear buying fabric online for projects where I need the colors to coordinate because I don’t want to make a mistake. I ordered swatches of the various blues to compare. Beautiful dresses Jodi! Your nesting energies served you well. I love Organic Cotton Plus’ fabrics. Lucky girls to wear these dresses all summer. So cute! I’m so happy you got your dresses made. They’re perfectly adorable. How satisfying it must be to see your girls in them. And what an act of love for Gianna and Gladys.